Max Paolucci's parody of a pulled Pepsi commercial has been viewed close to 60,000 times. When Max Paolucci first saw Pepsi's flop of a commercial featuring reality star and model Kendall Jenner that debuted Tuesday, it felt a little familiar. The nearly 3-minute long ad, that's since been pulled by the soda company, fell short of the message of "unity, peace and understanding" it had tried to project. Instead, it was perceived as "tone-deaf" for trivializing larger social issues and has been criticized for seeming cheery. For Paolucci, of Fishtown, it felt more like the campy, happy-go-lucky Mentos commercials from the 1990s – the ones that suggest that day-to-day problems, like breaking a heel or sitting on a freshly painted bench, could be solved by popping a chewy mint. 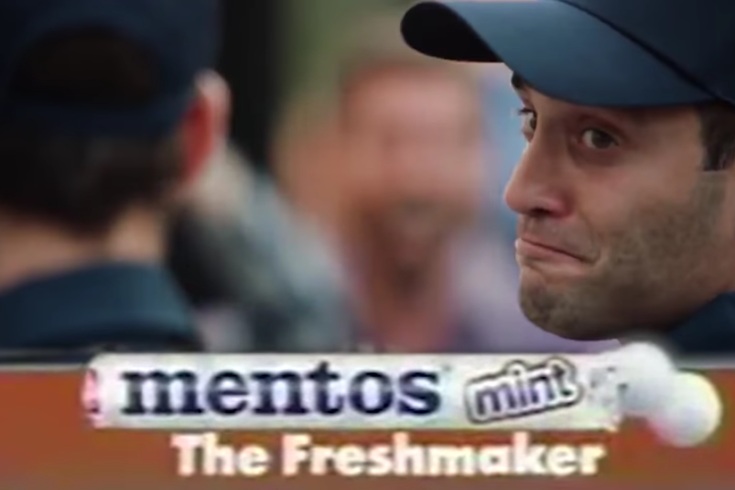 Each ad ended with the candy's tagline: "Mentos, The Freshmaker"
As a professional videographer who's worked on video campaigns for Nike and the Philadelphia Eagles, he decided to have a little fun. He scoured the internet and dubbed the theme over the Pepsi ad and uploaded the video to YouTube on Wednesday afternoon. It's since been viewed more than 57,000 times. "Just watching it, that's the first thing I thought of," he said. "[The Mentos commercials] solved really obvious problems with a product – it seemed what she was trying to do." It took Paolucci about four minutes to put the video together and despite some pacing work, the theme song and Pepsi ad fit pretty hand-in-glove. "It feels like it was made for it," he said. The Pepsi ad stars Jenner who looks onto a march where protesters are talking, laughing, smiling and holding generic posters like "Join the Conversation." While Jenner joins the march after getting waved on board by a protester, she hands a police officer a can of Pepsi to a roar of approval from her fellow "activists." The commercial tried to take on social issues but instead was accused of minimizing them. The end of the ad even was criticized for lifting an iconic image from a Black Lives Matter protest in Louisiana. Pepsi apologized, saying that the company "missed the mark." Its failed attempt comes after companies like Pennsylvania's 84 Lumber or Audi were praised for focusing on serious matters like immigration and gender equality in their Super Bowl commercials. While Paolucci said he considered the entire theme and feel of the catalog of Mentos commercials, the candy spot featuring a group of friends who get separated at a traffic light did stand out most. Paolucci said that it's "been fun" seeing his video make its way to every part of the internet, though he did make it just to send to his friends. "That commercial yesterday was a complete travesty of its own before I touched it," he said, "with the way it's so tone-deaf to everything." Paolucci's reaction to the Pepsi commercial being pulled? "I couldn't have been happier," he said.